Face Detection & Non-defective Display! 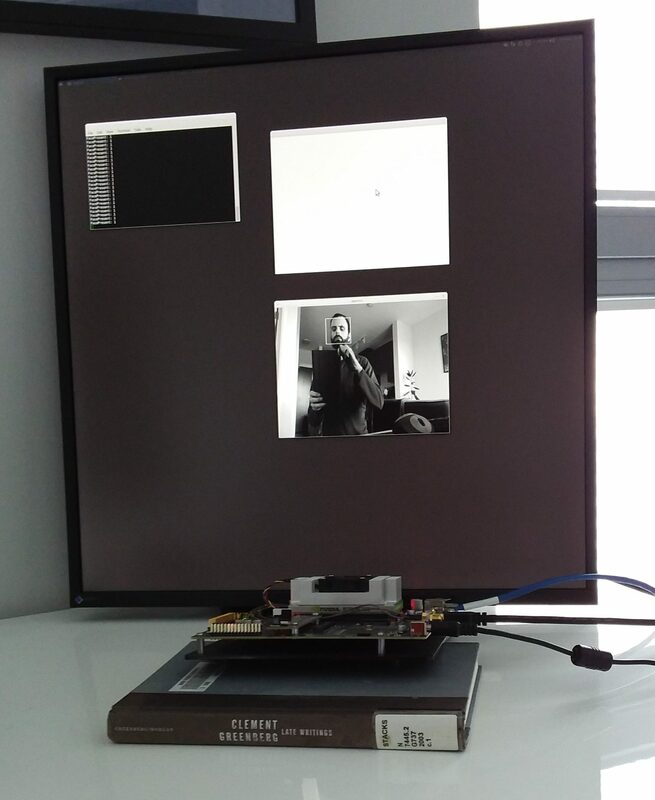 Last week I managed to get facial tracking code working on the Jetson. It’s using the old CUDA-based Haar-feature method, but seems to be working more or less fast and well enough. Though I did notice that the (a) it’s a little noisy (i.e. the detection of a face sometimes oscillates over time) and (b) the plant behind me (as seen above the mouse in the image above) was occasionally recognized as a face. This is good enough for this stage and hopefully I won’t need to train my own classifier to improve things. Later this week I’ll integrate the ‘painting’ rendering code and I’ll see how the experience feels in terms of change only when no one is looking. The third EIZO display arrived last week and it does not have any noticeable “pressure marks”. I suppose the first two were just bad luck and I hope I have better luck when I order the second unit.